I love asparagus and am so glad its back in season. I could eat this with every meal, or even on its own as a meal by itself. My favorite way to cook asparagus is on the grill, but it’s been so cold out that it isn’t worth the effort. Instead of grilling I often just use my oven! It only takes a few minutes and you get perfectly tender, crispy asparagus every time. Bend asparagus and snap off tough bottom part (about 2-3 inches), then wash and set aside to dry. 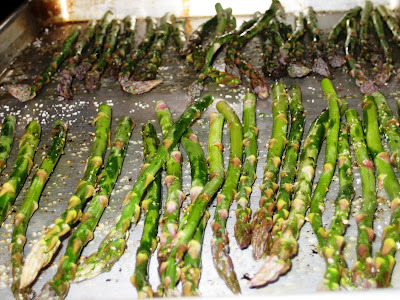 Place asparagus on a cookie sheet and drizzle with olive oil, then sprinkle with salt and pepper. Toss to ensure asparagus is coated thoroughly with the olive oil and salt & pepper. Bake for 10-15 minutes in a 450 degree oven until just tender, if you desired you can turn on the broiler the last few minutes to slightly char the surface. Do not over-cook or asparagus will turn soggy. This is my second-favorite way to eat asparagus -- and my first-favorite in the winter! When I can find the thick asparagus, I trim the ends, roll them in a tiny bit of olive oil, salt and pepper, and throw them on the grill! I like drizzled reduced balsamic on top and then shaving some parmesan over it too!